Dating Couple Max and Elias were the first team eliminated in the Season 3 premiere of CTV’s The Amazing Race Canada, seen by more than two million viewers. 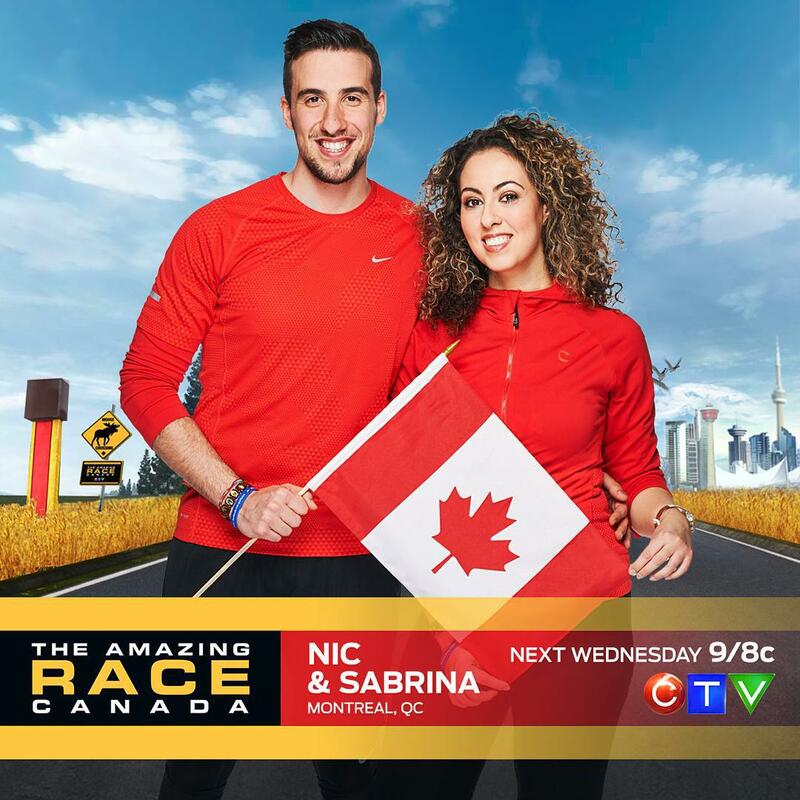 It did not look good at the beginning for the only Montreal team, couple Nic La Monaca, 22, of Anjou and Sabrina Mercuri, 32, of Lachine. The 12 teams gathered at the foot of the historic Château Frontenac Hotel in Québec City. After heading to Quay 22 in Québec’s harbour for their first clue, teams had to search through hundreds of bikes to find the one that their combination unlocked, and take a ferry across the St. Lawrence River to the town of Lévis, before departing for Toronto. Nic and Sabrina were virtually last in this competition. But they caught up with the rest of the gang as the teams headed towards Toronto on two separate flights. Teams encountered a word scramble challenge inside the St. Lawrence Market, tested their broadcasting chops with TSN’s James Duthie on the set of Sports Centre , and then made their way to Ontario Place where they competed in a three-part water obstacle course. Sabrina was a little hesitant on that one. Brothers Gino and Jesse Montani arrived first at the Air Canada Centre, winning the first leg of Season three. Nic and Sabrina ended up second. Host Jon Montgomery greeted them at the Pit Stop with their leg prize – two round-trip tickets from Air Canada to Rio de Janeiro, Brazil, and 2.5 million Petro-Points each from Petro-Canada, redeemable for six months of free gas. Next Wednesday, July 15, teams break out their passports and race to exotic Santiago, Chile, where tensions run high and communication with the locals proves to be a challenge. "It's as amazing as it looks!" Nic and Sabrina tweeted @Nic_SabrinaTARC. "And 1000x more stressful than 1 can imagine!"